The big volcanic explosion has created some magnificent underwater scenery, so we have a lot of wall dives and never ending drop-offs. 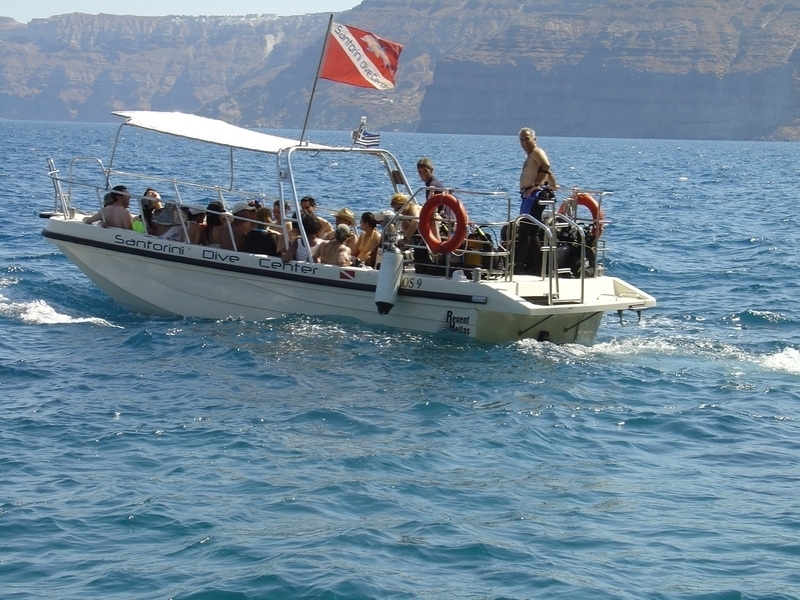 Santorini Dive Center has the best setup with easy and quick access to all the dive sites around the Caldera and the Volcanoes. 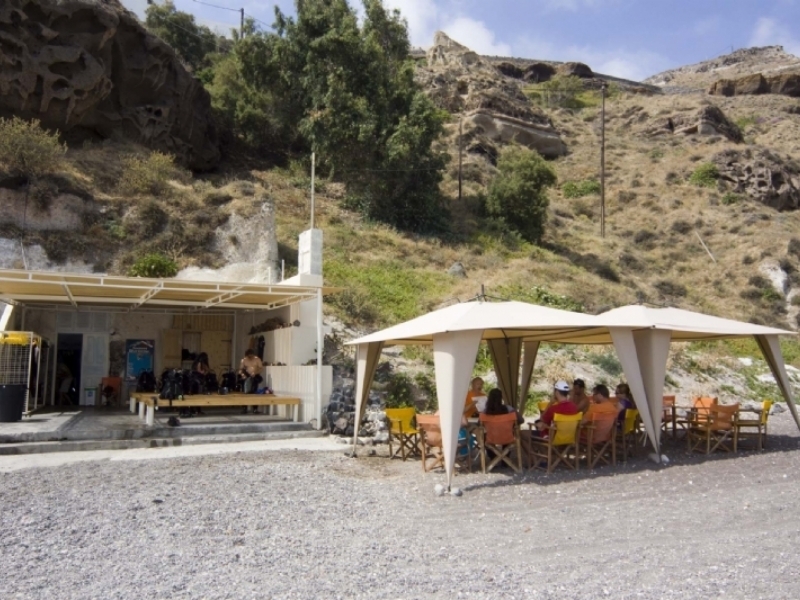 The Dive Station is located at Caldera Beach, a small remote beach with traditional caves below the cliffs of Akrotiri village nearby the ruins of the ancient city overlooking the Volcanoes. Our Minibuses will transfer you there from your hotel. The station offers an easy and quick access to all the great volcanic dive spots because all of them are few minutes away. The divers can board from the small pier on the 9m spacious fibreglass fast diveboat able to carry 20 persons in order to start their dive trip. At the dive sites around the New and Old Volcano you can see all the lava formations and find marine life such as lobsters, moray eels, clams and spirographs hiding amongst the lava rocks. There is also a small passenger ship that sunk in the bay at the new volcano. At the dives sites around the edge of the caldera and below the cliffs, there are many colorful sponges, nudibranchs, groupers, snappers, barracuda and many schools of fish. In front of the Dive Station, there is a protected reef full of marine life where our divers, students or Discover Scuba divers in different levels can have a unique dive and feed the fish. All our dives are guided by qualified instructors. Which exact sites we go to depend on the weather etc, butwe generally do one at the New or Old Volcano and one at the cliffs around the Caldera. We go out diving everyday, so you can choose whichever date suits you best. Upon return, the divers can either relax on the beautiful small beach or enjoy Greek cuisine and the breathtaking view of the Caldera cliffs and the Volcano at the traditional “Remezzo” tavern next to us. 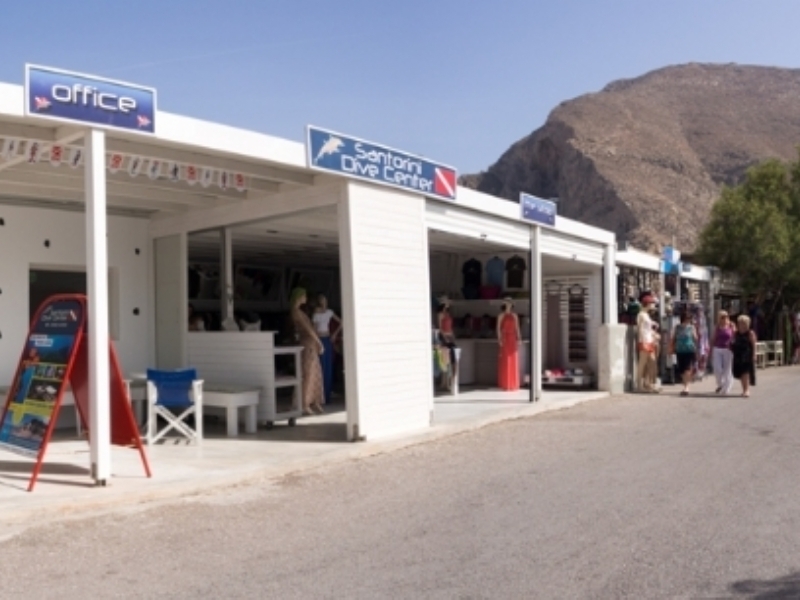 Santorini Dive Center has an office also in Perissa village, at the southeast part of the island and is locatedin Perissa Camping in front of the famous Black Sand Beach, between the Beach Bar and Yazz bar.